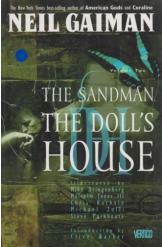 The Sandman: The Doll's House by Neil Gaiman. The book is in a very good condition, all pages intact. This book is the second volume of 11 volumes in the Sandman Library. This is a deeply brooding epic, elegantly penned by the author and illustrated by a cast of comic artists. In this volume Rose Walker finds more than she bargained for, long lost relatives, a serial killers'convention, and her true identity.